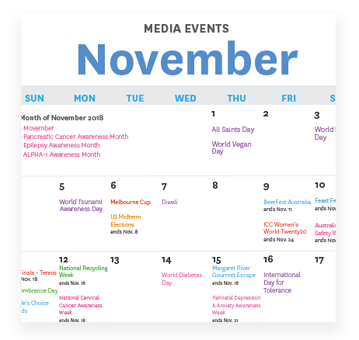 As a part of Australian Associated Press, we have leveraged our relationship with the newsroom to show you what upcoming media events journalists have on their coverage agenda. Keep up-to-date with key media events, notable upcoming news stories and what’s tending for the month of November in politics, sports, entertainment, charitable events and global commemoration days. Planning an upcoming event or a media release? Sign up free and have your event sent to over 12,000 editorial inboxes and media influencers with AAP’s Editorial Diary, free-of-charge.